The nation is expecting growth in infrastructure and plans to finance this growth with the help of their neighbor, China, the biggest trade partner of the Philippines. The manufacturing industry is currently the third top performing sector for the year led by infrastructure, real estate, transportation, and logistics. Under the Manufacturing Resurgence Program, the target is to contribute 15 percent of the country’s total employment by 2025 from only 10 percent in 2016, which will lead to more factories and potentially an increase of product categories. As a new retailer not wanting to compete for manufacturers in the U.S. or China, looking to source your products from the Philippines is an advantageous alternative. Ready to find your factory? We’ve helped 100s of companies find the best overseas manufacturers for their products. Get started with a free quote today. The top 10 exports from the Philippines account for 80 percent of the overall value of its global shipments. Such a huge percentage alludes to the high quality production or specialization in these 10 categories, which explains the large demand by other countries around the world. However, out of the top 10 exports, few are consumer goods. While the country isn’t currently a large producer of consumer goods like China, there is great potential for the consumer goods industry to expand in several different markets and thrive due to the future growth of infrastructure and factory employment. One of these markets is cosmetics. The Philippine’s importation of cosmetics and personal care products is declining. But not on account of decreasing demand. On the contrary, demand for beauty products is skyrocketing in the Philippines as consumers have increased their spending in line with the country’s strong economic performance. The import decline is a result of an increase in the nation’s local production, dominating 75 percent of the market. 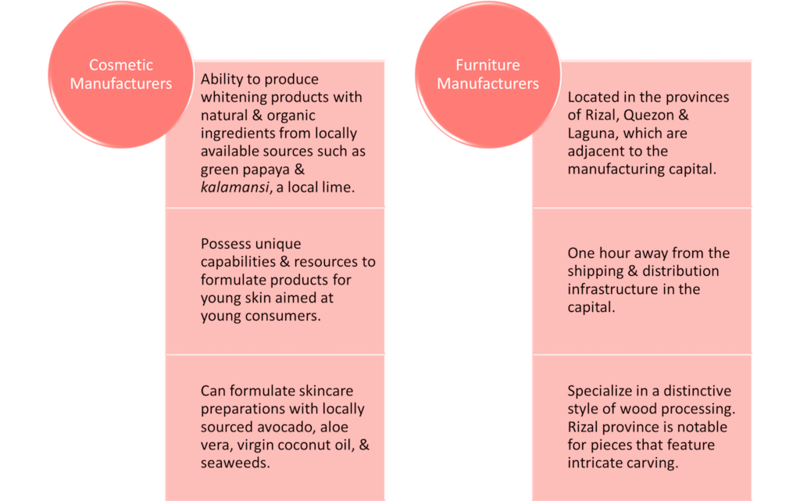 The cosmetic industry in the Philippines is ramping up production and using local resources to produce unique product. If your business is in beauty and cosmetics, the Philippines is an ideal location to source. Not only will you have access to unique resources that can aid product development and innovation, but you also get access to the consumer market that is already enthused about purchasing cosmetic goods. American firms such as Avon and Johnson & Johnson already have manufacturing facilities in the Philippines and gain a cost advantage by reaching the local consumers without having to export the products. When price is a strong determining factor of cosmetic purchases, your brand will have a much better chance if it can compete at a lower price point. Another market opportunity is furniture. There are four provinces in the Philippines that are major sourcing zones for wooden furniture. Sourcing home or office furniture from the Philippines for your eCommerce store would give you the advantage of selling uniquely made products. With four provinces devoted to sourcing furniture and all located near a major distribution hub, your startup could benefit from the specialized production and ease of shipping. Metro Manila is the industrial hub for the manufacture and distribution of various products like textiles, clothing, food, and electronics. Popular global brands like Polo, Nautica, Ann Taylor, Victoria’s Secret, Nike, and adidas source in the Philippines. While it’s hard for smaller brands to compete for time and attention from a factory that’s already producing products for big name brands like these, you can still benefit from the spillover of production expertise. It’s common for large factories to open up smaller factories to support the large production runs of bigger clients. These smaller factories often have the capacity for more clients and still produce at the high quality of the parent factory. The well-developed transportation and shipping infrastructure enhances the sourcing opportunities in Metro Manila. Most highways and streets in the city can be trusted to effectively transport raw materials and finished products. The Port of Manila is the primary seaport in the country and recognized as one of the busiest in the world. A surge of manufacturers in several neighboring provinces of Metro Manila are also using the port to ship goods. The second most populous city in the Philippines is the Cebu province, which is home to various industries that provide raw materials for suppliers of finished products throughout the country. Some of these resources include plant-based components like rattan, bamboo, Manila hemp, and wood. The province also provides an abundance of local marine materials like shells and pearls to factories. Sourcing from a country that has access to a surplus of raw materials is a huge way to save costs on production. The factories won’t have to spend money to import the components for your finished product so you end up paying less. Labor productivity for the manufacturing sector has grown by an average of 25.5 percent since the early 2000s, and the productivity for segments like consumer goods has also grown steadily. With government initiatives supporting manufacturing growth and productivity rising with paralleled growth, there’s a huge advantage for smaller foreign businesses to get into the industry early and start developing relationships with suppliers. As a small brand, the best thing you can do is find a supplier that doesn’t have many clients. Every country will add different costs to your overall manufacturing cost. The three most important to consider right off the bat are worker wages, shipping, and duties. Each of these costs differ depending on the country so you can completely avoid paying higher costs in one of these areas if the value of sourcing from that country doesn’t outweigh the costs. The total manufacturing cost includes the production run cost, mold, and worker wages. The first two are more difficult to decipher before you begin the sourcing process because they are largely dependent on the individual factories. 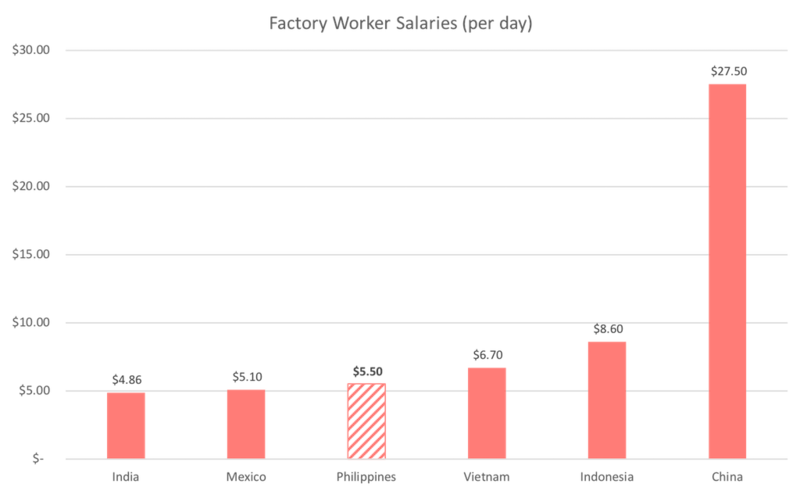 However, worker wages is a cost you can incorporate into your cost analysis at the beginning of your sourcing decision. The wages change steadily over a long period of time so any changes to them will only make a small impact on your production cost. These costs represent the cost to ship a medium production order from a factory in the Philippines to the United States. The cost will be different depending on your business’s location in the U.S., but overall this is what you can expect. 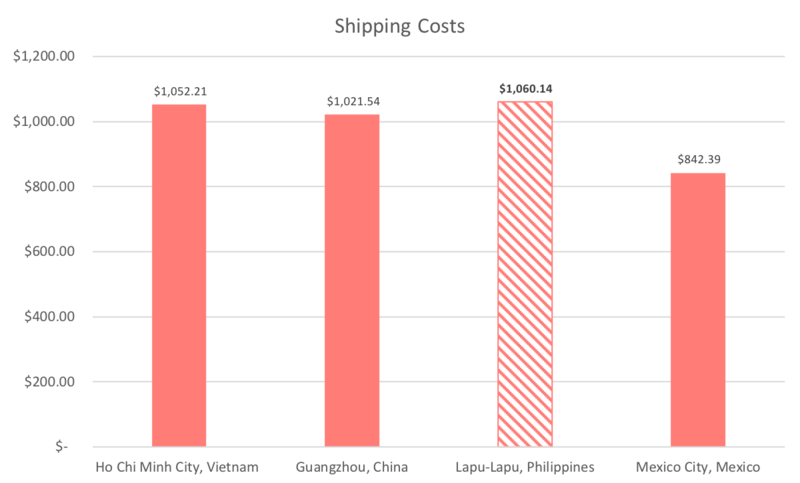 The cost to ship from the Philippines is the highest on a marginal level, but when you’re talking costs, even marginal differences impact your end profit. If you’re a U.S. based business, you benefit largely from the strong trade relationship that the U.S. has developed with the Philippines for hundreds of years. The U.S. directly invests in their manufacturing and wholesale trade so there are few tariffs imposed on imported goods into the United States. There is one cost you may not even consider in your production costs, and that is electricity. Electricity costs in the Philippines are high so it’s important to consider if your manufacturing activity requires a lot of electricity. The electricity cost can range from a high of 45% to a low of less than 1% of total cost. You can find factories in the Philippines on sites like Alibaba, but you face the risk of connecting with unreliable or deceiving suppliers. A list of suppliers can be obtained from the Philippine embassy or trade commission in your country. This is an easy way to the get the names and addresses of prospective suppliers but next steps involve determining their reliability, checking prices, quality, and available packaging. You can commission an agent to take care of the purchasing, but there’s no better way to gain confidence in your supplier like personally scrutinizing all aspects of the deal. It’s highly recommended to visit your supplier in the Philippines when ordering goods for the first time to inspire confidence and goodwill. No amount of research or skype calls can take the place of meeting a supplier in person and ensuring you feel good about the relationship. There’s also the possibility of losing money or paying more if you don’t personally size up the factory capacity and capabilities. Finally, meeting your supplier gives you the chance to eliminate any preconceived fears or concerns and begin a strong relationship face-to-face. Hiring an agent can help handle future orders. Agents can perform groundwork, follow up on placed orders, and deal with any problems that arise in the exporting process. It’s best to choose an agent who is familiar with all aspects of trading. This way, the agent not only checks up on the production run, but also assists the export process so you can trust that your goods are delivered on time. There’s still no better way to connect with suppliers than through the online platform Sourcify offers. As the buyer, you only get quotes from pre vetted factories that are capable of meeting your production budget and product demands. It’s never a bad idea to visit your supplier in person, but for small companies that don’t have the budget to spend money on international visits, the ability to chat with a supplier on the platform and receive trusted updates is one less worry and one more way to optimize your supply chain. Finding an overseas manufacturer can take months, with Sourcify it takes on average less than a week to get your first set of bids. Stop wasting time and money when you could have already started production.